COLUMBIA, S.C. -- A former cafeteria worker in South Carolina says his former employer subjected him to treatment akin to slavery and years of mental and physical abuse, according to a federal lawsuit filed Monday. In the complaint filed in federal court in Florence, attorneys for John Christopher Smith said that he worked at J&J Cafeteria in Conway for more than two decades. But about five years ago, according to the suit, a new manager took over the business and began abusing Smith, who the lawsuit describes as "mentally handicapped with mild cognitive impairment." Bobby Edwards repeatedly abused Smith, hitting him with objects including a frying pan, belts and tongs dipped in hot frying grease, according to the lawsuit. Edwards also would force Smith to work, to the point the man was so weak he had to be carried home. Saying some witnessed the alleged abuse, the lawsuit notes that Edwards went after Smith with a belt buckle for being too slow to replenish food items on the buffet line. "Plaintiff was heard crying like a child and yelling, 'No, Bobby, please!'" according to the suit. Ernest Edwards, the cafeteria's owner, knew about the alleged abuse but did nothing to stop it, according to the suit. The lawsuit also accuses Bobby Edwards and Ernest Edwards of race discrimination. Smith is black. His former employers are white. 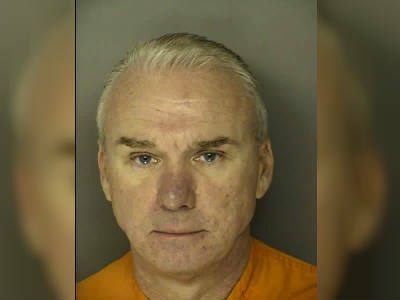 Bobby Edwards was released from jail on a $10,000 bond on Wednesday, CBS affiliate WGCL reported. Smith also says he was never paid, told instead by the cafeteria owner that a separate account had more than $30,000 in it for him. Phone messages left Monday by The Associated Press for both Bobby Edwards and Ernest Edwards were not immediately returned. Court papers listed no defense attorneys for either man. Smith also lived in an apartment near the cafeteria that Bobby Edwards owned. In those quarters, according to the lawsuit, Smith "lived in what can best be described as squalor." The apartment was "overrun with a cockroach infestation" and overall in a "sub-human condition" described in the lawsuit as "deplorable and harmful to human health." But, according to the lawsuit, Bobby Edwards threatened to have Smith arrested if he ever reported the conditions, telling him he would "stop Plaintiff's throat" and "beat Plaintiff's brains out of his head." About a year ago, officials from the Department of Social Services intervened and "rescued" Smith after getting a citizen complaint that a vulnerable adult was being abuse, the lawsuit reads. Scars on Smith's neck matched up with the allegations. Agency officials did not immediately return a message seeking comment on DSS' involvement in the case. Last year, Bobby Edwards was charged with assault in state court, and those charges are still pending.